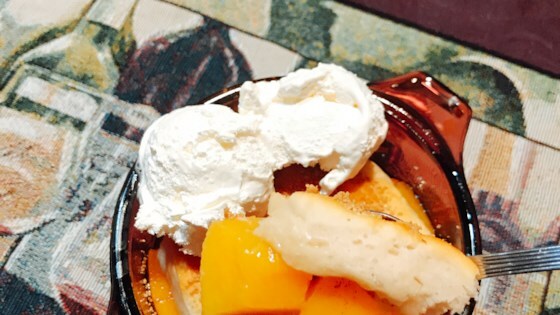 "This yummy peach cobbler was developed by my mom and me one night after dinner. It hits the spot if you are having a sweet craving, but it isn't super high in calories. This recipe will work in a 9x11-inch glass baking dish as well. Add a bit of ice cream if desired and enjoy!" Place 1 cup peaches into 8 individual ramekins. Mix 1/2 cup water and white sugar together in a bowl; stir until sugar is dissolved. Evenly divide sugar mixture over peaches. Sprinkle peaches with cinnamon and nutmeg. Dot about 3/4 teaspoon butter onto each serving of peaches. Unroll and separate crescent roll dough; completely cover peaches in each ramekin with 1 piece of dough. Cut small slits into each roll for ventilation during baking. Lightly brush each roll with water and sprinkle each with about 1/8 teaspoon brown sugar. Arrange ramekins onto a baking sheet. Bake in the preheated oven until cobblers are browned, 11 to 13 minutes. Allow cobblers to cool for 20 minutes before serving. Crescent rolls can be substituted with biscuits. Peaches can also be substituted with other summer fruits such as berries. So simple to make! I decided to use biscuits as the recipe submitter indicated was possible. Great recipe for a few servings!